Memphis was founded in 1819 on the bluffs high above the Mississippi River, a spot that would remain safe from the flooding waters. Those same bluffs that keep the city safe from the river also provide some of the best places to see Mississippi River in Memphis. There are not many cafes and restaurants that overlook the river; the historic buildings along Front Street actually face away from the river. 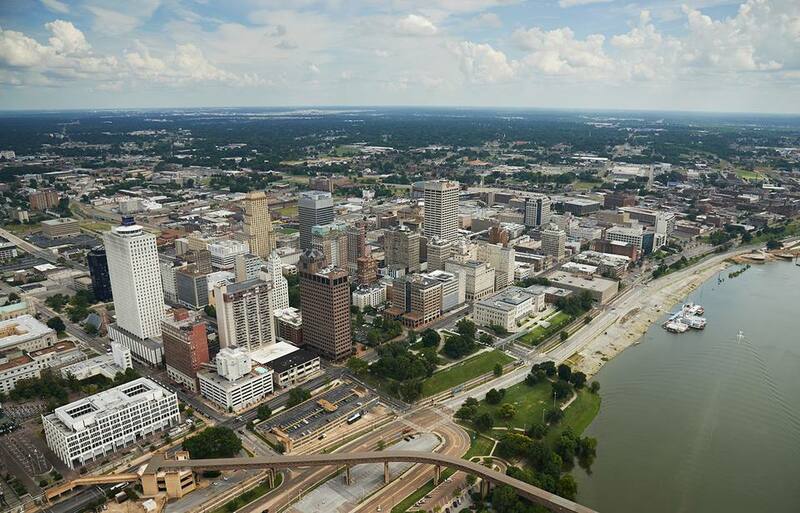 To find the best spots in Memphis for river viewing, you will want to check out the parks and trails, where there is an abundance of scenic outlooks. Go at sunset for a spectacular sight. There are a few hotels and local places off the beaten path, which can also give you a nice view of the river. Take a peaceful and scenic stroll along the river bluff. The best stretch is between Beale Street and the South Bluffs neighborhood. Along the way, take in views of the river below, as the path winds by some of the city's most beautiful homes. Mud Island sits between the Wolf River Harbor and the Mississippi River. The views of the mighty open river are minimal in the park itself, but the view of the Memphis skyline beyond the harbor, especially when watching a concert at the amphitheater, is fantastic. Across Island Drive from the homes, apartments, and businesses of Harbor Town on Mud Island sits the Mississippi Greenbelt Park. This 105-acre spacious, tree-lined park stretches along the riverfront with a 1.5-mile walking trail. This small park has some of the best views of the river. Martyr’s Park sits near the older bridges crossing the river off Interstate 55 on Channel 3 Drive. The park is connected to Tom Lee Park via the Riverwalk Pedestrian Path. In the core of downtown Memphis is Memphis Park, formerly known as Confederate Park. It sits high on a bluff overlooking the river next to the University of Memphis law school. It's a quiet place to escape the city and take in the view. Beale Street Landing at the foot of Beale Street is the city's home for riverboat cruises. A grassy expanse on top of the building provides unique views of the river and Mud Island. The River Inn of Harbor Town is a luxury hotel in Harbor Town on Mud Island. It has several vantage points for enjoying the river such as Terrace at the River Inn, Paulette's Restaurant, and Tug's. The Metal Museum is a small museum that focuses on blacksmithing and other metal works. Its backyard leads down to amazing views overlooking the Mississippi River. Downtown Memphis hotels like The Peabody Memphis and Madison Hotel provide guests great views of the Mississippi River from their rooftops. The Peabody welcomes visitors to take the elevator up without staying at the hotel. It offers a weekly rooftop party with DJs getting the weekend started on Thursdays during the spring and summer. The Madison offers a rooftop bar where you can take in the view.